IBM's PC, XT and AT models of the early-mid 1980s were great successes. They legitimised microcomputers for "serious" purposes and pushed standards and conventions onto an industry that sorely needed them. However, the problem for "Big Blue" was that reverse engineering meant that anyone could legally piggyback on their success. Very soon PC and AT clones were selling in vastly greater volumes than IBM's own product. To combat this, IBM developed Micro Channel Architecture (MCA), and incorporated it into most of their new 1987-92 PS/2 machines. MCA was a proprietary BUS technology that could not be cloned. Being closer to "plug-and-play" in concept, it was actually more advanced than the existing ISA BUS. The expectation was that the market would dump ISA (and hence the clones) as they had dumped 8-bit CP/M machines a few years before, and once again follow IBM into a bright new future. IBM's MCA developments had a fishhook. The cunning plan meant that anyone who wanted to make add-ons and cards for MCA PS/2 machines (or if they wanted to make their own MCA machines) had to pay royalties to IBM. Hardware manufacturers didn't like doing this. 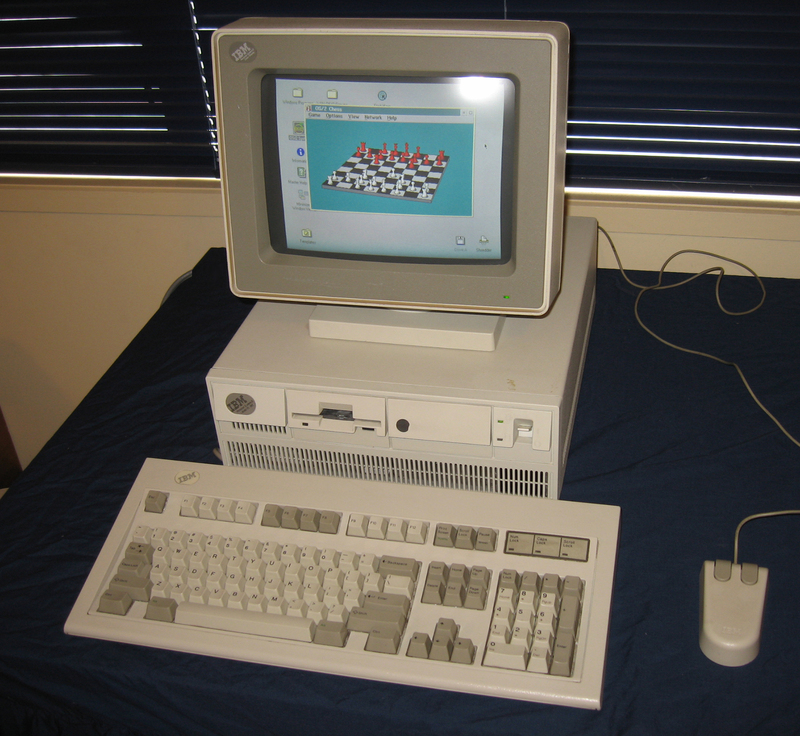 More importantly though, the standard IBM set with the PC and AT models had become very popular and the market seemed quite content to continue with the open architecture of the ISA BUS for a number of years yet. So MCA was a flop. Expansion cards were expensive, few and far between. Nevertheless, these MCA computers are interesting historical artifacts as they do represent an alternative direction for microcomputer technology in the late 1980s, albeit one which never blossomed. The PS/2 model 70, released in 1988, is an example of one of these MCA offerings. It has the typical PS/2 front bezels but is taller than my other PS/2, the pizza-box Model 30-286. My Model 70-121, strutting its stuff above, has a 120MB drive, 6MB of memory and a 386-20DX processor. Also, that's not Windows 3.1 on the screen. This baby is loaded with OS/2 2.1! You can see it enjoying the bundled chess game. The story of OS/2 is a saga in it's own right. It was another attempt by IBM to capture the microcomputer market, except this time with software rather than hardware. The idea was to introduce OS/2 through the PS/2 line of machines, until it became the dominant DOS for PCs. Like MCA, OS/2 failed despite being technically superior. It couldn't stop the juggernaut which was Microsoft Windows. Ironically, Microsoft actually helped IBM write the early versions of OS/2! I got hold of this machine free from a recycler, who knew I was looking for a PS/2 and called me when this was passed in. I was actually seeking a replacement board for my 30-286 model at the time, but I certainly wasn't going to say no to a Model 70. On inspection I found everything worked fine apart from the floppy drive. Thanks to a Vintage Computer Forum buddy and the Vintage Computer Marketplace, I soon had a replacement. I like the external design of the PS/2s. They look kind of cool. They cost a lot more than a conventional PC of the period so I guess they were regarded as special! Sure they are proprietary but they have a number of interesting design features such as the snap-apart construction for easy servicing. I've elaborated on this and how I went about getting the unit up and running, in this blog article. OS/2 2.1 is fun too, and a nice change from the usual Microsoft fare!